The latest exhibition at the Renaissance Society, parrottree—building for bigger than real, is arguably one of its most difficult in recent history. Although there are 36 pieces in the show, my initial response upon entering the gallery at its crowded Sunday opening was: Where is the art? 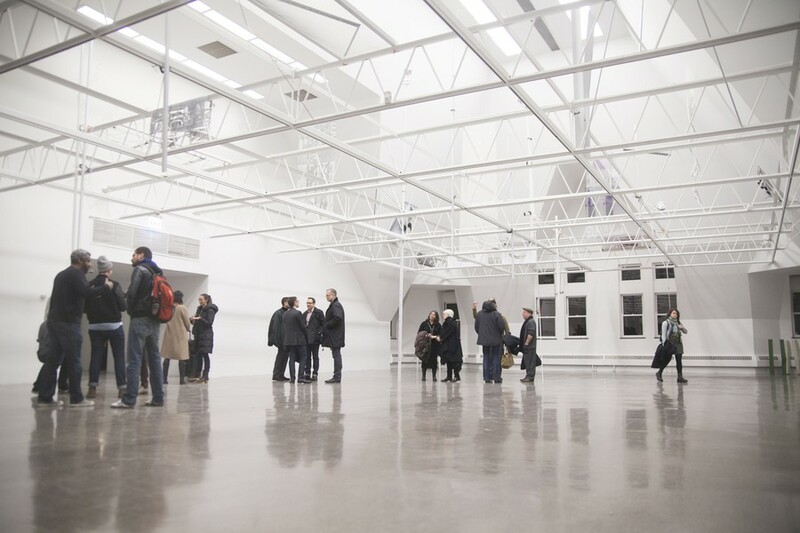 Perhaps that was because the majority of Berlin-based artist Nora Schultz’s works—made of steel, paper, mesh, and rubber scraps—are white, like the gallery itself, and are suspended or attached to the permanent steel grid that divides the upper and lower halves of the gallery space. In preparation for the opening, which was both Schultz’s first solo exhibition this side of the Atlantic and new Chief Curator and Executive Director Solveig Øvstebø’s first show at the Society, Schultz arrived on December 27 without a single finished or even started piece. In the intervening two weeks, Schultz transformed the gallery into her studio, and began a scavenger hunt for materials around University grounds, particularly the Society’s storage room. “Process comes from a certain reality,” Schultz said at the artist’s talk on Sunday evening. Throughout the past few weeks, Stone recalled finding Schultz sitting on the floor of the gallery, listening to music and staring into space for hours, feeling it out. I too sat on the gallery’s floor just two weeks later, trying to unpack what Schultz had done to transform the place. Most of Schultz’s pieces are thin metal scraps and almost transparent netting that hang or stand vertical to the grid. Because her materials are often thin and painted white, light gray, or purple, the space gives the impression of lightness, fragility, and impermanence. It’s as if Schultz is commenting on the transient nature of exhibitions, or even of art itself, both in tailoring her show to its site and creating these fragile pieces, some of which recall ghostlike apparitions. What complicates the show is Schultz’s interest in the meaning of words and her use of text. Many of the pieces are painted, drawn with a Sharpie, or cut out, featuring phrases like “Am I am Ma?” “Machine Dreaming Mind,” and “Reconstructed cognitive architecture that’s components could be arranged in a few simple steps.” On one wall, an annotated New York Times article about photography from January 2, 2014 seems out of place. Thus the connection between the text and the sculpture is tenuous, but perhaps the language is working to further destabilize the exhibition as a whole, and in the case of the already two-week-old Times article, points again to the show’s finitude. A further seemingly disjunct part of the show is “the parrot,” for which the show is named and whose manipulated song plays on repeat throughout the gallery. As the legend goes, a group of resilient monk parakeets have inhabited Hyde Park for nearly 50 years, despite arctic winters. When Schultz learned about this, she selected the South American parrot as a “collaborator” for her exhibition. Like Schultz, the parrots are visitors to Chicago and have adapted to the neighborhood, using the materials at hand to construct their nests. While the relationship between the various components of the show—the unobtrusive sculptures made from scrap, the text on these sculptures, the enigmatic parrot—feels weak, this weak connection seems to be the point. For the show, Schultz has assimilated to her environment, building in some sense her own parrot’s nest in the grid of the Renaissance Society. But the nebulous, fragile nature of her pieces reminds us that just as quickly as she made the gallery her home, Schultz will soon be rousted and will move on to her next project. parrottree—building for bigger than real will be at The Renaissance Society through February 23.